Welcome back everyone. It has been a long and fairly arduous process to get to this point, but finally after some long bouts of play-testing and some adjustments, the first installment of the new section is complete. 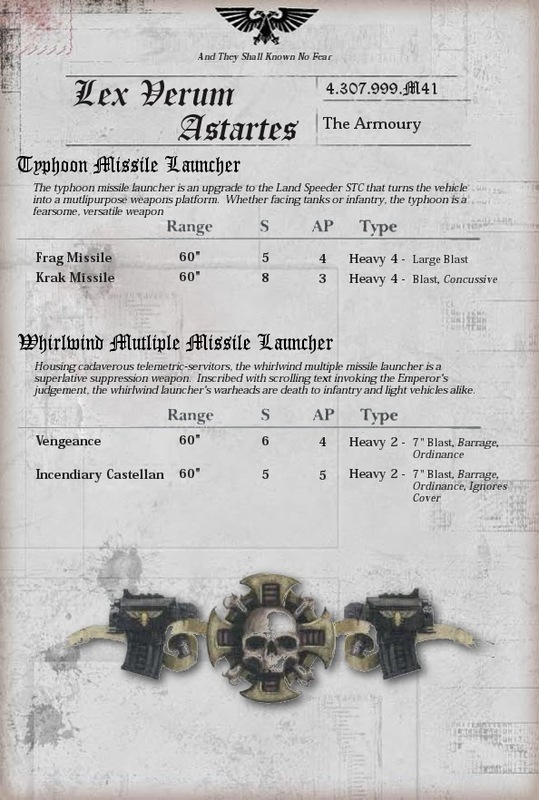 There were a lot of details that needed to be honed in on before this post was able to be made, and these details govern the entirety of the codex from basic principles to specific unit statistics. Many of the project's finer points were worked out to a rough point and tested using a few starting points. This allowed me to tweak some of the specific points such as weapon ranges, S and AP values, the basics of unit stat lines, and even how to balance certain pieces of special wargear. I'm excited to add in some pieces of wargear which are a little under-represented in the current incarnation of the book. Alongside this, I have a few cosmetic changes that will be implemented in the next set of data slates, but for now are left as the previous versions have been. 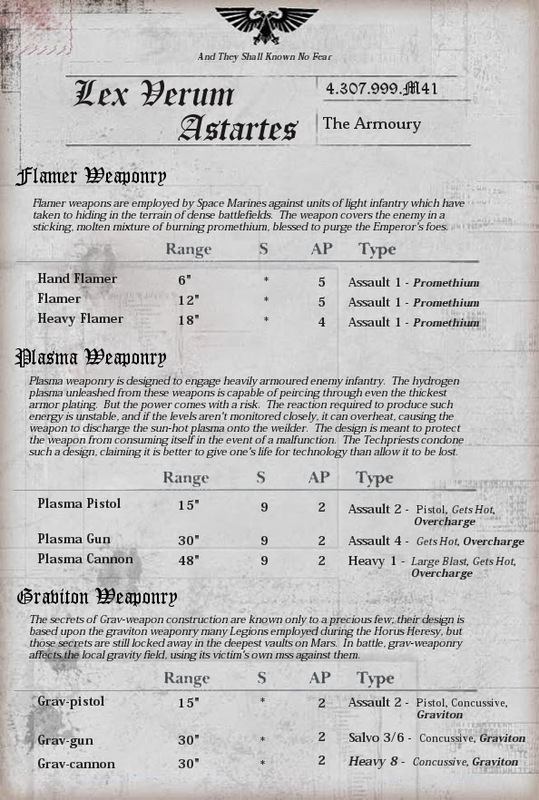 The main element to this is altering the font used for titles throughout the codex. Currently the gothic-style font looks nice, but is a little cumbersome to read at times. I plan to reel that back and use a font which is easier to read, while still keeping the current font for major section headers. the body font seems to be working aright, so for now I'll keep it. 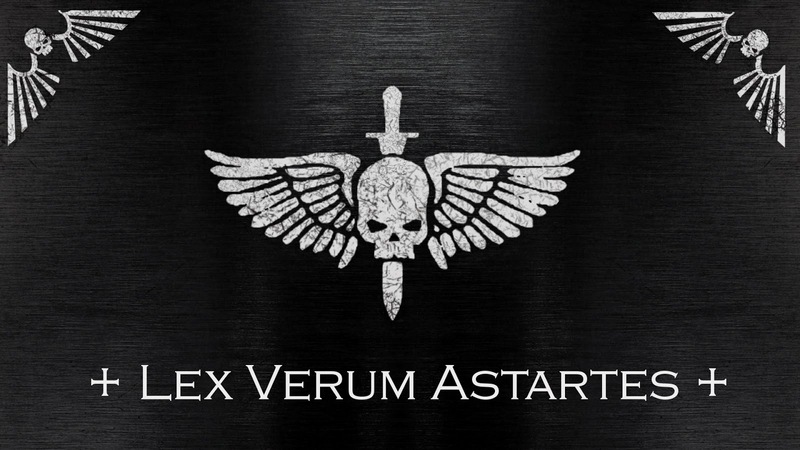 Additionally, I have never really be happy with the "Verum Astartes" label for the codex. I feel it just doesn't really convey immediately what the codex is. 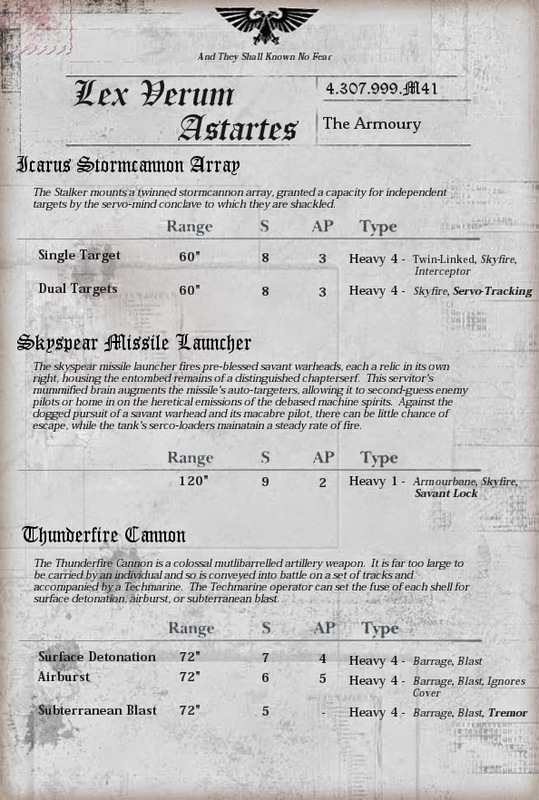 So I will keep the title for this series, but as it now reads in this set of data-slates, the new self-identifier will be Codex: Tru-Scale Astartes. But there will be more updates for the codex and the project as a whole soon. For now I'll give you the first to come of The Armoury, chosen by popular and unanimous demand. Next up will be the Melee weaponry. Hopefully I should be able to get to them sooner with much of the core balance worked out. 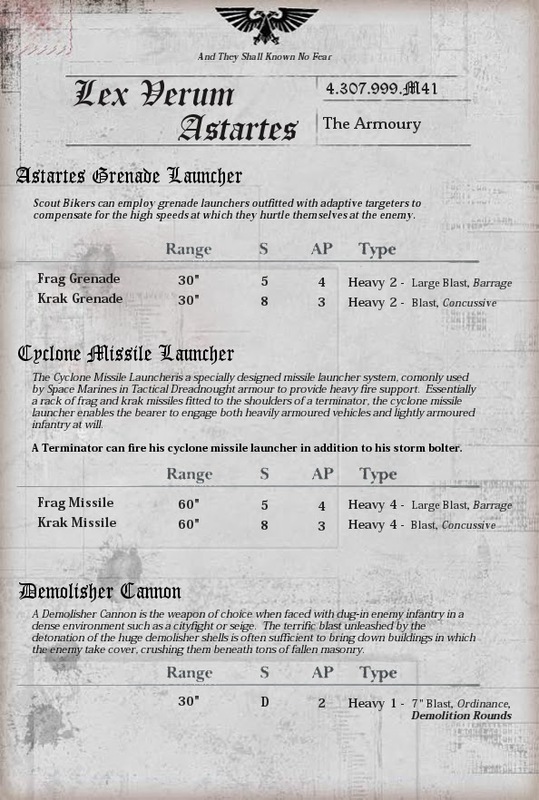 There are a few special rules unique to some of these weapons. Mostly this will dictate how they actually function on the table-top, or alternate means to use them. 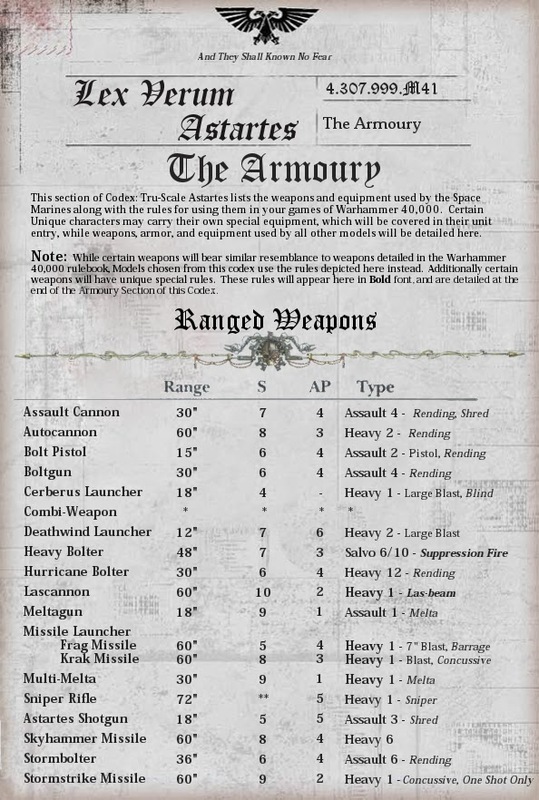 These rules will be collected and detailed at the end of the Armoury section. For now, you'll have to ponder on them, but they'll be unveiled soon.